She's your girly-girl with an edge, let her wear something that reflects her style. 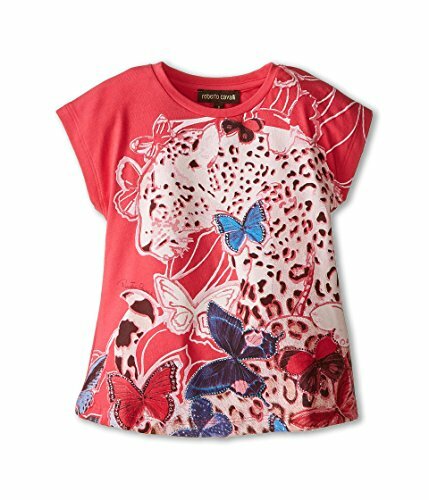 Only the Roberto Cavalli® Kids Short Sleeve Butterfly Tee will do! Jewel neckline. Short sleeves with straight hem. Bold and beautiful butterfly-leopard graphic print at front. 94% cotton, 6% elastane. Machine wash cold, tumble dry low. Imported. This item may ship with an attached security tag. Merchandise returned without the original security tag attached or a damaged tag may not qualify for a refund. Measurements: Length: 14 in Product measurements were taken using size 2 Years (Toddler). Please note that measurements may vary by size. 94% cotton, 6% elastane. Machine wash cold, tumble dry low. Imported. This item may ship with an attached security tag. Merchandise returned without the original security tag attached or a damaged tag may not qualify for a refund. Measurements: Length: 14 in Product measurements were taken using size 2 Years (Toddler). Please note that measurements may vary by size.